Lewis Hamilton failed to qualify for the race, after his Mercedes caught fire during Saturday's running. The Brit has permission to start the race, but after extensive repairs to the car, he has to start from the pit lane. He'll also be behind Kevin Magnussen, who has also been relegated to the pit lane after repairs following his own qualifying crash incident. At the same time, Pastor Maldonado had yet more qualifying woes by taking a five place grid penalty, but the Lotus driver will be lonely at the back of the grid until Hamilton and Magnussen can join him. 0 places. Lewis Hamilton - The gearbox of Car 44 has been changed before 6 consecutive events have expired and the survival cell has been replaced resulting in the competitor having to start from the Pit Lane. 0 places. 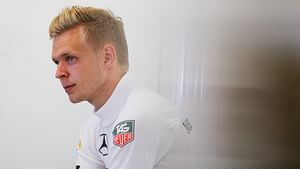 Kevin Magnussen - The gearbox of Car 20 has been changed before 6 consecutive events have expired and the survival cell has been replaced resulting in the competitor having to start from the Pit Lane. 5 places. Pastor Maldonado - The gearbox of Car 13 has been changed before 6 consecutive events have expired.